Nordic Skiing is also available at Holiday Valley. Departs from Toronto: Merton - 6:45 ; York Mills - 7:00 ; Oakville Bronte/QEW- 7:50. Note that there's no HW7 pick-up for this trip. Please arrive at departure area at least 10 minutes before departure time. 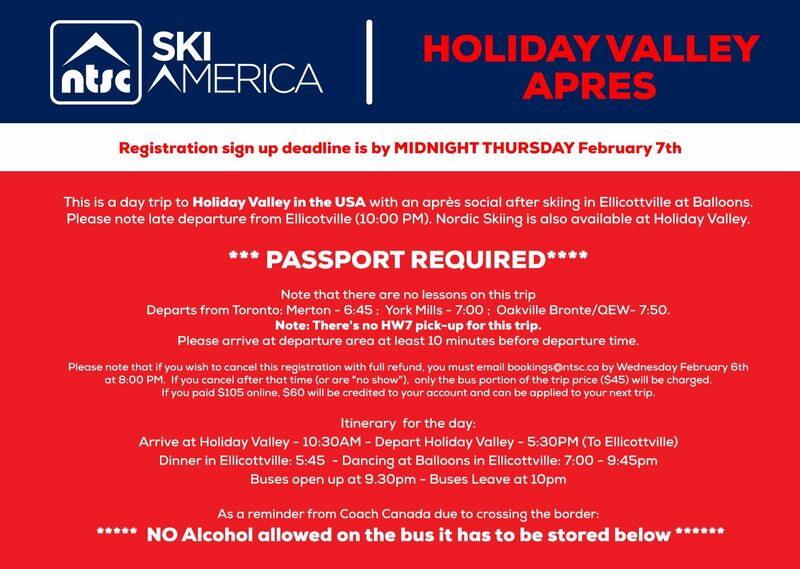 Please note that if you wish to cancel this registration with full refund, you must email bookings@ntsc.ca by Wednesday February 6th at 8:00 PM. If you cancel after that time (or are "no show"), only the bus portion of the trip price ($45) will be charged. If you paid $105 online, $60 will be credited to your account and can be applied to your next trip. Dinner in Ellicottville: 5:45 - ?? ?